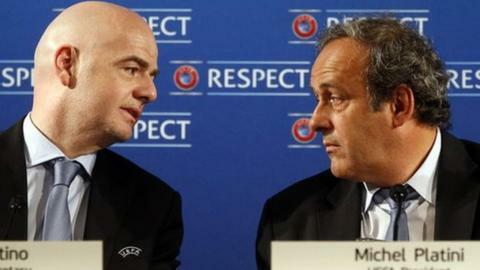 Fifa presidential candidate Gianni Infantino has backed Uefa boss Michel Platini's bid to clear his name. Platini, 60, announced on Wednesday he was withdrawing from the race to replace suspended Fifa president Sepp Blatter, 79, in next month's election. Blatter and Platini were suspended from football-related activities for eight years after being found guilty of breaches over a £1.3m ($2m) "disloyal payment" made to Platini in 2011. Both are appealing against the ruling. The Fifa ethics committee found Blatter and Platini had demonstrated an "abusive execution" of their positions. The timing of the Fifa presidential election on 26 February means Platini cannot run. That leaves Uefa general secretary Infantino, 45, as one of two European candidates to lead world football's governing body, alongside former Fifa assistant general secretary Jerome Champagne. "I fully respect and understand Michel Platini's decision," said Infantino. "I wish him all the best in his efforts to clear his name as soon as possible and I reiterate my support for his right to a due process." Infantino had previously stated he would withdraw from the race if Frenchman Platini was allowed to stand. Yet the Swiss says he has the full support of the Uefa executive for his decision to run for the Fifa presidency. "I have been further gratified and encouraged by the support I have received from the many football people I met all over the world during my campaign," he added. "I am conscious of my responsibility to them and to all of those who love our game. I look forward to building together with them the Fifa that they want to see, a Fifa with football at its heart."